Apptrix provides superior performance, increased security, reliability and scalability over existing in-house IT solutions at significant cost and resource savings. With our managed application hosting solution, our staff of Infor CloudSuite Industrial (CSI/SyteLine), Infor CloudSuite Service Management (ISM) experts and Microsoft Certified System Engineers ensure that your mission critical applications are delivered reliably and quickly to the user's desktop. Taking your IT operations offsite results in significant cost and resource savings, allowing you to focus on your business rather than your IT. The experts at Apptrix take on your IT requirements and provide product solution hosting. We maintain the servers, the server operating system, SQL databases and your data at our two fully equipped state-of-the-art facilities. You provide your licenses for the applications and we engage as your IT staff for those solutions. Apptrix has served as an IT partner and managed hosting provider for 20 years. We tackle your IT requests, monitoring and patching and provide the "care and feeding" of your applications. You may choose to use us only during the implementation period, or to help with an upgrade. If you choose to expand your solution scale or footprint, we can quickly provision the new solutions and add them to your environments. It's your choice. We customize our services to address your IT needs. Contact us today to discuss managed application solutions for your IT environments. You decide when patches are loaded or when it's time to upgrade to a new version. We won't force you to load software you don't need. This limits the risk to the business and provides you with peace of mind. No budget overruns. No surprise expenses. With a monthly fee, you can forecast costs more accurately. No risk to business growth. Apptrix maintains capacity ahead of demand. Business growth isn't limited by the system. Limited service disruption. You control your system updates. There is no forced march to a new version or taking an update or fix that isn't necessary. Improved business focus. 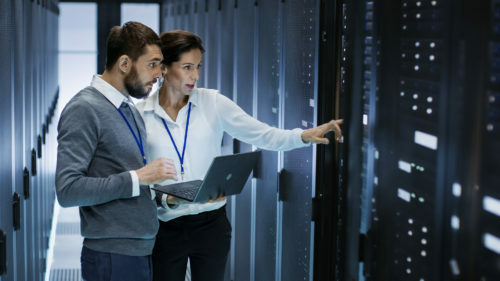 By aligning with a data center and managed services partner, you focus on your core business issues and have 24/7 access to our extensive technical expertise. Strengthened cybersecurity – Backups are stored off-site. Improved data center resources. You benefit from our state-of-the-art data center resources maintained at the current level of technology. Operating Systems and SQL Server licenses are included in the fee. Server maintenance and administration costs are also on us. Improved return on investment. Reduced hardware costs result in improved ROI. Because you’re outsourcing your IT to us, you can redirect your resources where they’re really needed. Reduced operating costs. When you select Apptrix as your managed application hosting partner, it typically translates into 60% to 90% savings in upfront costs, and 30% to 50% in annual savings.